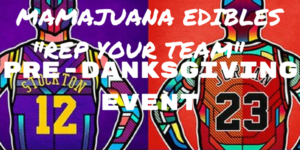 Mamajuana Edibles will hold its first “Rep Your Team” PreDanksgiving Event! Wear your favorite sport team’s jersey, cap, or colors to rep your squad. Listen to the DJ spin all your favorite 90s and 2000s hottest track! Also enjoy the games, prizes, free edibles, food, vendors and lots of weed. Limited amount of cannabis-infused Danksgiving dinners will be given away! This is a smokeout event, so Bring Your Own Weed (BYOW). Must be 21+ to attend with valid ID. All vendors must register in advance and pay a fee. Growers meet greenies who want to plant marijuana. Anyone who wants to giveaway, share or exchange weed, seeds, buds, clones, trim or plants. It’s legal. Come party and listen to cannabis activists enlighten the crowd about recent political events on marijuana. Great place to relax and meet other cannabis lovers from around the US.